Dr. Clara Amorim , ISPA- Instituto Universitário. 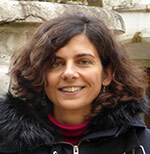 Clara Amorim was born and lived in Portugal, Lisbon, where she graduated in Biology by the University of Lisbon (1991). Subsequently, she completed an MPhil degree by the University of Leicester (1994) on fish foraging behavior, and a PhD degree by the University of Aberdeen (1997) on acoustic communication in fish. After the PhD she returned to Portugal and continued her research in fish bioacoustics. Her research has focused on the significance of acoustic signals in species recognition, choice and agonistic interactions. Recently she has also focused on the impact of anthropogenic noise on fish. She has been a lecturer since 2001 at Lusofona University and more recently at ISPA- Instituto Universitário, where she is currently a Principal Investigator. Darlene Ketten is a marine scientist and neurophysiologist specializing in biomechanics of hearing and hearing loss. She received a B.A., Washington University (Biology; French); M.S., Massachusetts Institute of Technology. (Biological Oceanography), and Ph.D., Johns Hopkins Medical Institutions (Neuroanatomy, Behavioural Ecology; Experimental Radiology). She currently holds joint appointments as Professor of Imaging and Applied Physics, Curtin University; Assistant Clinical Professor (PT), Otology and Laryngology, Harvard Medical School; and Chief Scientist, WHOI Computerized Scanning and Imaging Facility (http://csi.whoi.edu). Dr. Ketten has twenty-five years’ experience in auditory physiology, noise and blast trauma, and high resolution radiology. She has specialty accreditation in Neuroradiology, Veterinary Pathology, and Forensic Pathology and is a Fellow and designated Subject Matter Expert in Bioacoustics (ASA), Senior Fellow of the National Institutes of Health (NIH/NIDCD), Fellow of the Association for the Advancement of Science (AAAS), and ISO working group member (Underwater Acoustics). Dr. Ketten has served on international and US Federal advisory boards and as a specialty panelist and expert witness for NIH, the National Academy of Sciences, the Marine Mammal Commission, NATO, NOAA, NIH, SACLANT, NIH/CDC on Cochlear Implants, CHABA on Blast Trauma, and EU Polar Research Policy Board, and has provided testimony and briefings for the U.S. House, U.S. Senate, and Pentagon staff.